A Southwest train passing through Lymington railroad crossing. 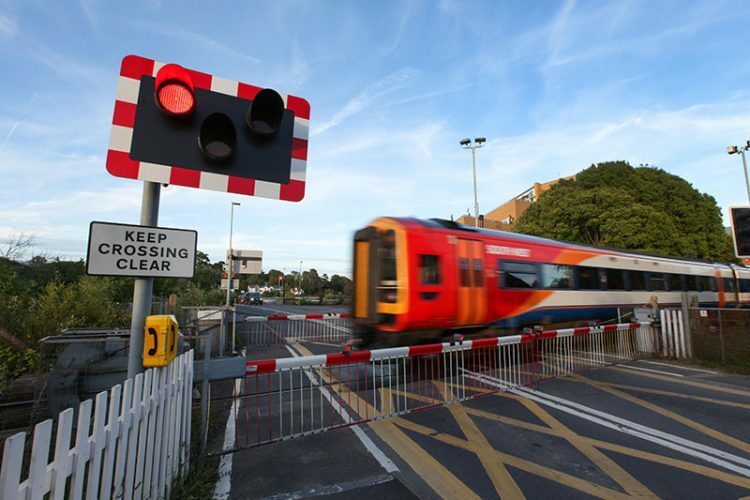 Over an eleven-month period, from December 2016 to October 2017, DEG Signal carried out the detail design for the upgrade to a level crossing at Lymington Town railway station in Hampshire. Working as a subcontractor to S&T Cover, the upgrade aimed to improve reliability, meet current standards and offer less frequent maintenance visits. This project built on our experience of detail design of level crossing upgrades. In fact, earlier in 2016, we did a very similar project, for a level crossing upgrade at Wool, Dorset. Looking in detail at the Lymington Town crossing, it is a MCB-CCTV type level crossing located at 97m 48ch between Lymington Junction and Lymington Pier (ELR: BLP). The level crossing and single line branch is controlled from Brockenhurst signal box, located five-miles North of Lymington Town. Lymington Town MCB LC previously utilised GWE Mk1 barrier machines which were obsolete and nearly life expired. They were becoming more and more difficult to maintain due to their age and non-availability of spares. The scope of the project was to replace the existing GWE Mk1 barrier machines with BR843 type supplied by SPX. New barrier booms were also provided because the new barrier machines are positioned differently to the existing ones. The existing barrier control circuitry was also brought up to current standard to enable the use of BR843 barrier machines. We are currently in discussion with Network Rail and various suppliers as to how whole life costs can be reduced and reliability increased for level crossings.